Want a better way to see what your team is working on? 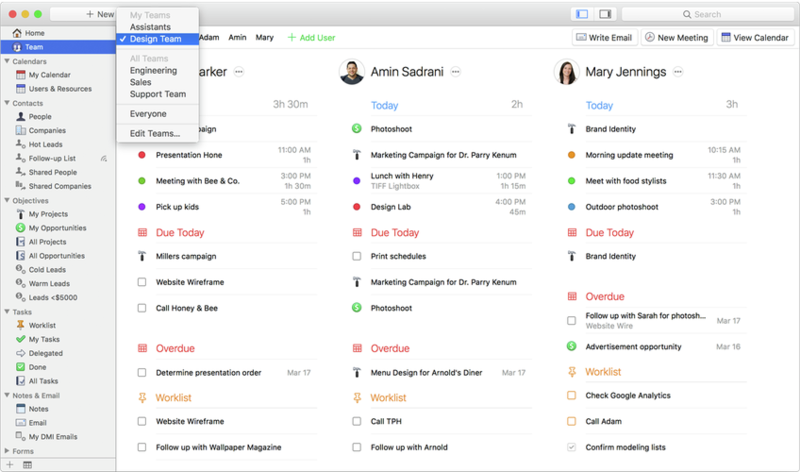 Now you can with Team View for Daylite on your Mac. For businesses that have multiple team members and need to keep track of what everyone is working on, it can be very inefficient to interrupt, email, or chat someone to ask what they’re working on. We created Team View so that you can easily see what everyone in a team is working on – without needing to interrupt them. Team View allows you to see what’s on other people’s plate for today. In one view, you can see the whole sales or design team’s appointments today, the total duration of their appointments, due tasks, and what’s on their Worklist. You can also see upcoming appointments, tasks, projects, and opportunities. 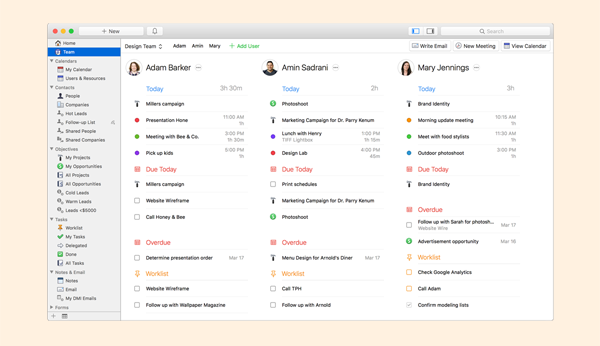 Team View makes it easier to gauge how busy a team’s workload is. You can use the Team View to get an overall picture of how busy a team is before scheduling a meeting or delegating someone a new task. Team View also allows you to see if your team is using Daylite properly because you can see if they’re adding tasks to their Worklist and adding their appointments and meetings to their Daylite calendar. For example, let’s say you notice your team members are adding way too many tasks to their Worklist each day. You can encourage them to limit their Worklist to the top 3-4 main priorities for the day so they learn to focus and prioritize better. Another example is making sure your team is properly categorizing their appointments. For some companies, this is crucial for not only knowing visually where your team is spending their time, but also for proper reporting based on appointment category. When you’re in the Team View, you can select which team you want to view – whether you want to see the Sales Team, Design Team, or Marketing Team. You can easily switch between teams if you have multiple teams in your company and want to get an overview of what each one if working on. To add a team member, click the “Add User” and this will take you to the Users & Teams section in your Daylite Preferences. The Team View uses the same privacy and permission settings. So if someone on your team has an appointment set to private, you won’t be able to view the details in Team View. As a business owner or manager, it’s a good practice to get into the routine of checking Team View each morning to review what your team’s are working on. You can quickly check that their priorities are aligned with the company’s key objectives without having to interrupt or micromanage them. From the Team View, you can write an email to everyone on that team in one click. Just choose the “write email” button and it will open a new email and add everyone on the team to the email chain. The same way you can write an email to everyone in a team, you can also schedule a meeting for the whole team. From the Team View, select the “Schedule Meeting” button and it will open a new appointment window in Daylite and auto link everyone to the meeting. This saves you time having to manually invite each individual team member. Appointments in the Team View are displayed in a list. But if you want to see everyone’s schedule overplayed in the calendar, you can click the “View Calendar” button to jump to the calendar. The calendar will automatically show you a filtered list of everyone’s schedule from that team. With Team View you can quickly check what your team is working on as well as easily schedule meetings and send emails. Watch this short video to see Team View in action. Team View is available for both Daylite 6 Self-Serve and Daylite 6 Cloud. Not on Daylite 6 yet? Visit our upgrading page.